Affiliate Marketing is an attractive option for many who want that passive income. If you have done all the hard work in the beginning, you are sure to reap your rewards even while you sleep. However, it can be overwhelming for the beginners as they lay their foundation with affiliate marketing. From setting up an affiliate website to selecting the right affiliate program, there’s a lot that is required to be done to make way for a successful marketing future. In this article, you will learn in detailed What is Affiliate Marketing? How to Start Affiliate Marketing? and How to Choose the Best Affiliate Program? for your new startup business. While we have several tutorials on how to set up an affiliate blog there’s little information on how to select the right affiliate marketing program for beginners. To begin with, it’s critical to select a good market where you can apply your marketing expertise. Not all products listed with an affiliate program are profitable and so, even the best marketing strategies can go waste if the program isn’t attractive enough for the audience, or if it doesn’t offer good commission rates. At the same time, to be successful in your affiliate marketing efforts you also need to keep a track of your leads. An efficient affiliate tracker like LeadDyno will not just help you to keep a track of your leads, conversions, and commissions earned in real-time, but will also allow you to connect with their wide network affiliates and influencers who can promote your product on your behalf and help you increase your sales. While you can look for a profitable niche first and then find the best affiliate programs, it would be much faster if you take it the other way around. And, if you are a beginner you must select your affiliate programs very carefully that makes it easy for you to start with and is not too complicated. ClickBank is great to start with since it offers several great affiliate programs, especially for digital download products. In general, there are three aspects that differentiate a good and revenue generating program from the ones that are a total waste of time. Based on the number of researches over the past few years, experts suggest that an affiliate program that offers commission below 60% is not worth it. Most of the products on ClickBank sell at a price range of $30 to $70, so that gives you an opportunity to earn a minimum of a handsome $18 per sale. There are tons of products on ClickBank that offers a payout percentage of 60% and more. If you sell a product with a high price, for instance, $150 in that case, a 50% commission is still really good. Although a 50% commission is not recommended. You can earn commissions also on a recurring basis if a customer signs up for subscriptions and each time the customer pays for the subscription you earn a percentage where it is usually 40% and is worth the time. If the gravity rating of ClickBank is high, it means that more affiliates are making sales. The gravity rating denotes the total number of sales made during a week. Which also means that the products are in high demand and has a great chance to turn profitable for you. Affiliate marketers tend to buy internet marketing products quite frequently using their own affiliate link and in turn, get a good discount n the product. This, unfortunately, messes up the gravity rating for the week, so when taking the gravity rating into consideration, it would be better to avoid the gravity of the internet marketing products at face value. The products that get hit the most in this category are Marketing and Ads. Low gravity does not essentially mean that it’s unprofitable since every new product has to begin somewhere. But, if a product has low gravity you may want to know why? Go to the sales page and check if the sales copy is lengthy. Short sales copies do not tend to convert well. Make sure that you compare the sales copy with competing products. If it’s not as convincing as the one by the competitors then you know why it’s not performing well. At the same time, you also need the support of a reliable affiliate tracking tool like LeadDyno that can keep a track of your sales and commissions. The best part is that it provides a seamless experience through its mobile app where you can keep checking the status on the dashboard on a daily basis. What’s more? It can also help you get your first affiliate website. Now, all you need is to find out the best affiliate marketing programs for beginners to start off with your affiliate marketing venture. How to Choose the Best CPA Programs? CPA (Cost Per Acquisition Programs) offer payouts for each of your action, and not just for sale. For instance, some of the CPA programs offer commissions for each email address collected, some others pay for zip codes, while others may pay you for filling out an application form. Some of the best CPA programs to start with would be affiliate.com, NeverBlue, and PeerFly. Which are the Best CPA Programs? Those that come with zip code offers because these are the easiest. All you need to do is to get the visitors to enter their zip code and you are granted a commission. Those who offer $1 per sale in the form of commissions and according to experts that’s still worth your time than those who offer 20cents per sale. Think about it. If you have an email list you can promote via email, but if you don’t, then check the terms and conditions of the program and then go ahead. Physical products have a low markup in comparison to the digital products like the ones offered by ClickBank, so here even if you can make 40% on commissions that should be a great deal. While running an internet search on the primary search term of your niche if you discover huge competition, it’s actually a good sign. This is because there is strong competition from affiliates in the PPC ads style. This is a clear sign that this is a highly profitable niche. Use a free tool like WordTracker to track the number of niche search terms for the market. A good market will have lots of niche search terms with not much competition. 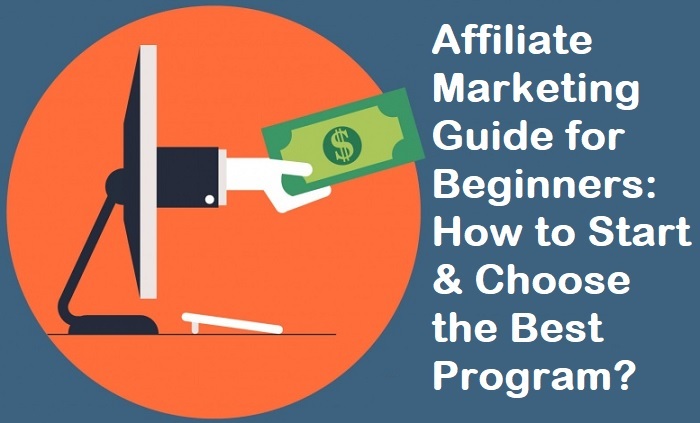 While you are looking for a good affiliate program for beginners, make sure that you try out various programs and don’t just stick to one. There are plenty of quality affiliate marketing programs within a niche that you can choose to promote, and this will help you build a list. So, choose wisely and make your way to success.